Hidden away in their 15mm Falklands range, MJ Figures have a couple of AFVs, including a Panhard AML-90 armoured car. 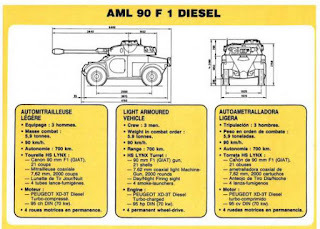 This alternative to Peter Pig's AML is rarely seen either on the web or on tables, so here is a closer look. 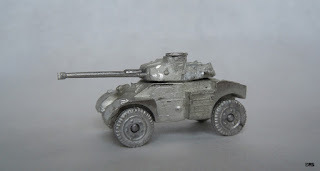 The model comes in 10 parts (turret, cuppola hatch cover, gun barrel, body, 4 wheels, 2 axles) and requires some assembly which is mostly straightforward. The casting quality is decent despite some pitting although some of the details will be lost during the necessary clean-up phase. The main drawback is that the axles actually go through the wheels which means trimming and very visible gap in the wheel hubs. On the other hand, the wheel/axle assembly is well designed and correct spacing of the wheels is easy. In addition, the front mudguards are much too large and need to be filed back. Replacing the smoke grenade dischargers with plastic of brass rod is probably best as these as prone to miscasting. The model itself is well detailed, perhaps even more so than Peter Pig's though it lacks the latter's clean, chunky style. 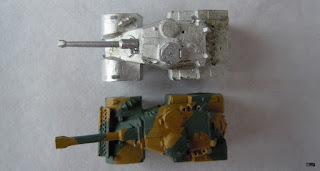 Size-wise, it looks smaller than Martin Goddard's version mostly because it has a smaller turret, one that is in fact probably better proportioned when compared to the body, and a main gun that is not as exaggerated. As you can see below, the hulls are in fact pretty much the same size. 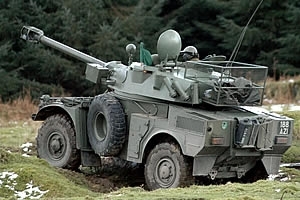 The turret itself has a raised cuppola and flat hatch covers, a rather uncommon feature found only on current Lebanese army AML 90s as far as I kow. 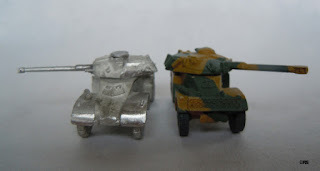 Besides the turret, the main difference with the Peter Pig model is the engine deck. 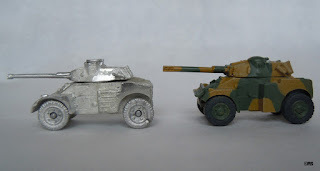 The MJ Figures model actually represents a different, re-engined diesel version similar to the photo on the left while the Peter Pig model has an original petrol engine. 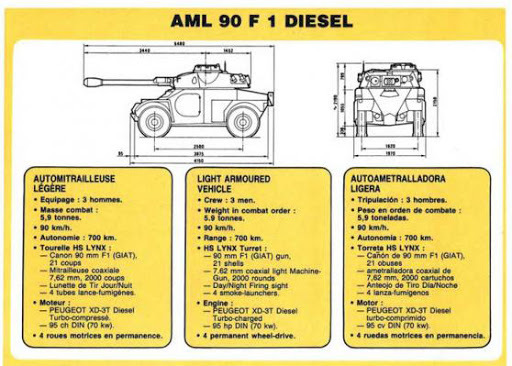 While this is a French export upgrade, it is pretty close to the diesel engine deck of South African Eland Mk 5s and Mk 7s although it isn't a total match. 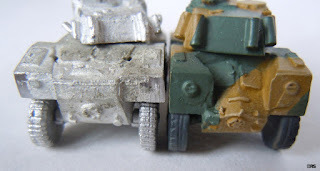 Interestingly, neither the MJ Figures nor the Peter Pig AML model will allow you to fit a spare wheel between the left-hand side mudguards (although the MJ Figures comes closest) because the gap is too small or the wheels too large. 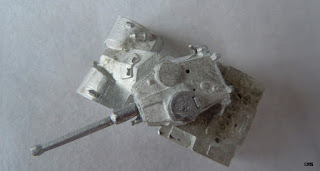 All in all, this is a quite useful model that can serve as the basis for conversions providing your spares box is well stocked. 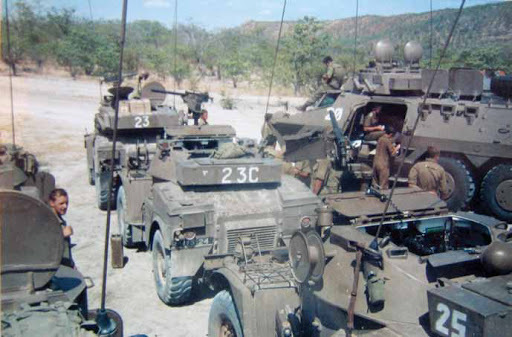 Filing down the raised cuppola, adding a dome-shaped hatch cover, a sand channel and a .30 cal machine gun will get you as close as you can get to a SADF "Noddy car" in 15mm. 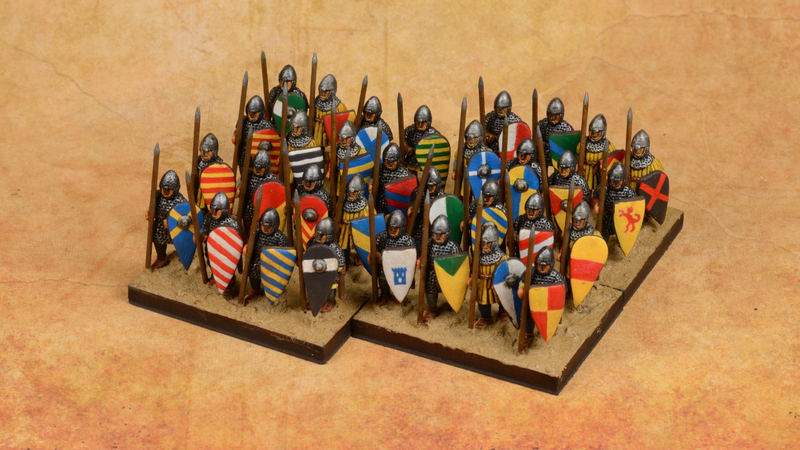 Thanks for this, I was wondering which model was best, so I will have to get the MJ figures ones for my Argies.